Article by Malcolm Gillies: a guest critic at the Bartók Plus Opera Festival in Miskolc, Hungary who writes about its celebration of Kodály’s legacy as a composer. Zoltán Kodály, Béla Bartók and Ernő Dohnányi were friends who did so much to make Hungary the superbly musical land it is today. Music history now generally recognizes Bartók as the most innovative musical thinker, Dohnányi as a virtuoso pianist and conductor, and Kodály as a master educator. Yet each displayed a deep and broad musicianship, and all left substantial legacies as composers. 2017 is the fiftieth anniversary of the death of Kodály, the most long-lived of this trio. Beyond the many formal tributes, perhaps his most enduring commemoration after half a century is the superb music-making of Hungary’s current generations of musicians, so many of whom are proud beneficiaries of Kodály’s “concept” of folksong-based musical education. Now one of Hungary’s major musical exports, Kodály’s conception was recognised last year by UNESCO as “part of living cultural heritage”. That quality of well-trained musicianship was evident in abundance at this year’s “Bartók Plus Festival”, held in Miskolc (pronounced “mish-colts”), a couple of hours’ drive north-east of Budapest. Whether in the main-stage events or the accompanying dozens of fringe happenings, this truly is a musical nation. While officially an opera festival, the Festival’s direction, led by Gergely Kesselyák, does not get caught up on definitions. But it is seriously dedicated to the rejuvenation of opera for the masses, whether in its performances of established works or in its creation of new, popular productions. Although in most years Bartók’s stage works are centrally featured, the Festival always has other themes. Hence, the enigmatic “Plus” in its title. And in 2017 the biggest “Plus” was Bartók’s colleague, Kodály, along with a line-up of new stage works (some more “operatic” than others) by Hungarian composers, as well as several Festival commissions, and a variety of co-productions or guest invitations. You might ask which operas Kodály actually wrote, as no two commentators will give you the same answer. But most agree about including The Spinning Room (A székely fonó), first performed at the Budapest Opera in 1932, and a few also include a now-forgotten, unsuccessful commission of Czinka Panna, which was premiered at the Opera in Budapest during 1948, for the centenary of the start of the Hungarian War of Independence. And then there is the “comic opera” version of Háry János, making its first appearance at the Budapest Opera in 1926. At Miskolc The Spinning Room was a central feature in a spectacular production brought across from Budapest, where a new production premiered last year, directed by the Pole, Michał Znaniecki. Advertised as “genre pictures”, it was simulcast from Miskolc’s main hall to nearby Szent István Square, for the broader population to appreciate. This work, drawing on Kodály’s version of 1927, is a progression of over twenty Transylvanian folksongs, worked up into a vivid, fast-moving orchestral texture. Sometimes more like opera, at other times tending towards theatre, a song recital, or a folksong symphony, The Spinning Room nonetheless makes more musical than dramatic sense. It is, certainly, a loose collection of songs, centred around the trials and tribulations of a village housewife amid the passing, yet unchanging, tapestry of rural life. Contralto Erika Gál sang in a rich, folksy, often parlando, style, nowhere more effective than when her themes are of a darker hue: death, tragedy, absence, consolation and solitude. This lower-register mood, in other female parts (Bernadett Wiedemann, Erika Kiss) as well, provided a much needed sense of continuity and return, when interspersed with occasional, almost random scenes of communal celebration or jollity. 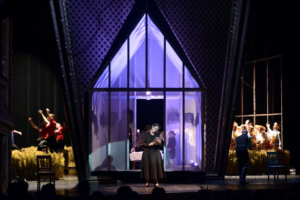 In keeping with Kodály’s aim for this opera, this production did bring “the Hungarian city closer to the Hungarian village” with its presentation of scenes from village life. 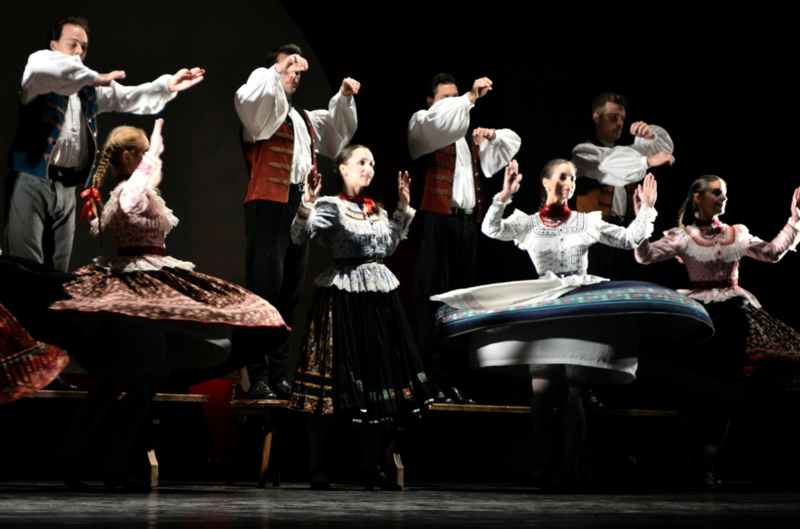 The Spinning Room was also aided by Kodály’s sinewy, varied, and developmental score for orchestra, conducted in Miskolc by Balázs Kocsár, which countered the essentially static nature of the many stanzas of folksong and set-piece dance routines. So, too, did the stark picture-frame, geometric set, realized by Luigi Scoglio, which effortlessly turned itself around, and even inside out, thereby effecting rapid changes of scene. Despite Znaniecki’s Polish background (Kodály’s mother was of Polish descent, by the way), this was still a quintessentially Hungarian evening, in fact, almost a sacred act of cultural transmission. This production of The Spinning Room was hugely appreciated by its Miskolcian audience, which responded eagerly to the invitation during the final curtain calls to sing along “and be buried together by two rosemary bushes . . . side by side” in the distant forest. In short, they loved it. The Festival did not attempt a revival of Kodály’s forgotten Czinka Panna, but it did pay homage to Háry János, although through playing the six-movement orchestral suite following the telling of the story by narrator, Ferenc Fandl. Although Fandl claimed it as “a real opera-house piece” and did effectively mimic the key characters in his narration, the piece came across as a neatly-played piece of abstract music, with little compelling dramatic reference. What followed Háry János, however, was another orchestral work with a spell-binding stage presence: Kodály’s Peacock Variations, as interpreted by the Hungarian National Dance Ensemble. 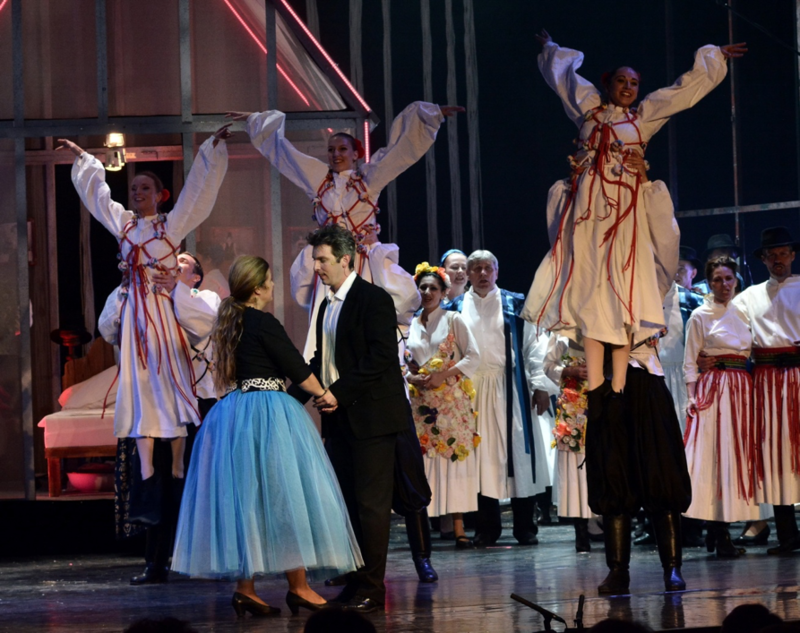 Zoltán Zsuráfszky’s choreography made heavy demands in the wardrobe department for the seventeen couples involved, with constant changes of costume and colours, ensemble sizes, and dance styles matching the changes of the lighting show which paralleled the progress of Kodály’s escalating variations. All this apparatus contributed to a flawlessly integrated work. They were not dancing to the music; the dance just was the music. And that musical performance, from the Miskolc Symphony Orchestra in the pit conducted by Tamás Gál, was the perfect partner to this visual and kinaesthetic display. Kodály also dominated the programme of the Festival’s opening concert, featuring the Pécs-based Pannon Philharmonic Orchestra, along with the Kodály Chorus of Debrecen and the Cantemus Chorus of Nyíregyháza. (Yes, there is much more to Hungarian musical life beyond Budapest.) The oratorio Psalmus Hungaricus originated in 1923, as a joint commission for the fiftieth anniversary of the union of Buda and Pest, which Kodály shared with Bartók (Dance Suite) and Dohnányi (Festival Overture). It was an ideal work with which to open a festival now honouring Kodály’s posthumous fifty years. Psalmus Hungaricus is the work that the tenor, József Simándy, made famous, calling it his “main export item”. It became — and probably still is — Kodály’s most performed large work abroad. Now, while the soloist, Attila Fekete, lacked some of Simándy’s exquisite sensitivities, he rolled out a big, full tone with clear diction and so was able, with some ease, to cut through the massed choirs (which performed with gusto) and the orchestra (which lacked some power, particularly in the strings). Then followed a new cello concerto by Gyula Fekete, written with Kodály the cellist in mind. Unfortunately, it is a somewhat vapid piece, although was securely rendered by soloist Barnabás Baranyi. Kodály’s Budavári Te Deum then concluded this opening concert, with a nicely balanced vocal quartet joining the choirs and orchestra. Nowhere was the cohesion of this large ensemble better demonstrated than in the concluding apotheosis of the work, building part by part to its final climax, with confident direction from conductor Tibor Bogányi. Although these were the main Kodály works performed at the Bartók Plus Festival, there was much more Kodály in the accompanying programme of events: talks, chamber, choir and solo concerts, and folksong sessions in the Square. Even the Festival’s most experimental piece, Girolamo Deraco’s Phone, a symphonic installation for chorus and one hundred gramophones, was dedicated to the memory of Kodály. I would have loved to know what he would have made of it! From the Bartók Plus Festival I came away with a different Kodály in my ears: a more instrumental and less vocal Kodály, and a composer of larger forms. Certainly, most of these works were still in a folk-music idiom, but the imagination, skill, even wit, of Kodály as writer for instruments was highlighted during this visit to Miskolc. Then again, his simple compositional routines and the tight range of his formal types were sometimes rather too apparent, reminding me why his compositions have occasionally been branded as works of a great musical “summariser” than of a great “innovator”. And why in the view of posterity he has been seen as more of a trail-blazer in the field of music education, where his insights have helped to produce those impeccable musical foundations from which this Miskolc Festival so benefitted this June. Brisbane-born Malcolm Gillies retired in 2014 after serving seven years as a university president in London. He was recently Acting Head of the Australian National University’s School of Music for half a year, although still remains based in London as an educational consultant and music critic. In 1983-85 he was a Hungarian Government Scholar in Budapest, where he became interested in the Kodály concept, which he later taught at the Universities of Melbourne and Queensland, and became involved in activities of KMEIA. He now sits on the Board of the Bartók Complete Critical Edition in Budapest. He attended the 2017 Bartók Plus Festival in Miskolc as a guest critic of that Festival.